Click the "Priority Types" command on the Tools menu. Click the "..." button in the Priority field of the Event Editor or Task Editor. Click the "..." button in the Priority Field on the Event Defaults tab of the Event Calendar Properties window or Task Defaults tab of the Task Calendar Properties window. Double-click a priority name on the Priorities tab of the Calendar Items area of the main window, or right-click the priority name and select the "Priority Type Properties" command. Events and tasks can be assigned priorities, and use the associated priority appearance when the Priorities tab in the Calendar Items List is active, or when the "Color Events Using" option in the View menu is set to show priority colors. 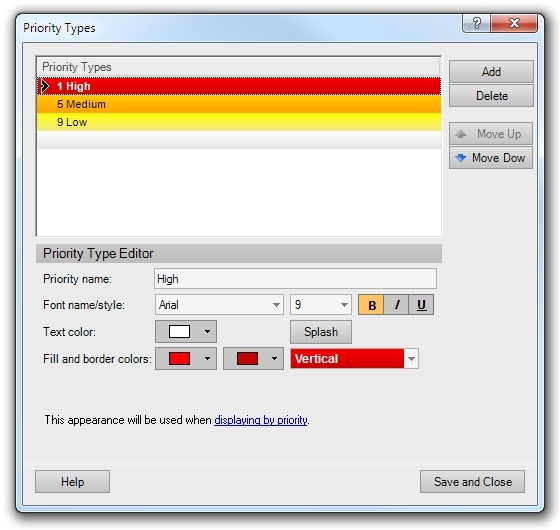 The Priority Editor enables priority types to be created, renamed, or deleted. It also enables priority colors to be modified. This window can be accessed by clicking the "..." button in the Priority input field on the Event Editor or Task Editor. It can also be accessed from the Tools menu. The priority list shows all the currently defined priority types. The selected priority will be indicated with an arrow. To select a different priority type, click its row in the list. After selecting a priority type, its name and appearance can be modified. You can also add or delete priority types using the Add and Delete buttons. There can be a maximum of 10 priority types defined. The number in front of the priority name indicates the priority level, with 1 being the highest and 10 the lowest. Priority types can be moved up or down in the list by clicking the Move Up or Move Down buttons. If fewer than 10 priority types have been defined, a new priority type can be added by clicking the "Add" button. The new priority type will be inserted into the list and the "Priority name" field activated to enable naming of the new priority type. To delete a priority, click its name in the list and then click the Delete button. If the deleted priority type is associated with any events or tasks, the association will be removed. Note, the "None" priority type is a special case, used for events or tasks that have no associated priority. It cannot be deleted, but it can be renamed or its appearance changed. An existing priority type can be renamed or its appearance changed. To do this, click the priority type in the list. Next, enter the new priority name or desired appearance using the appearance editor.